Soon, we will be breaking into song with “Sweet Caroline” as we cheer on the Wildcats. From the crazed fans of D Block to the scantily clad swim team, we know what to expect off the court. But what does the 2017-18 season hold for the Davidson men’s basketball team? Let Cats Stats give you some preseason tips of what to expect before the first swish on McKillop court. We’ll look to the exhibition game for some hints and then give a couple more tips. Peyton Aldridge ‘18 – In the exhibition game versus Hampden Sydney, the preseason All-A10 forward was perfect from the field in the 2nd half, hitting all five of his shots, including three 3-pointers. Aldridge began the season stronger than last year, scoring 16 more points in this season’s exhibition than last year’s. Expect Aldridge to continue to be a threat. Last year, he was in the 82nd percentile with 0.961 PPP (points per possession) as a post-up player and in the 97th percentile as a spot up player (1.301 PPP). Oskar Michelsen ’18 – Due to injury, Michelsen played very few minutes last year. So, the exhibition game becomes our main weathervane to gain a sense of the direction of his performance. In that game, Michelsen had a solid offensive performance with 9 points on just 6 field goal attempts and led the team with 9 total rebounds. Oskar’s strong shooting in the opener may foreshadow a return to his 2015 form when he started 16 of the 32 games. Jon Axel Gudmundsson ’20 – In the exhibition, Gudmundsson led the team in both true shooting percentage (TS%) and effective field goal percentage eFG%, shooting 88% and 90% respectively. Of returning players, Gudmundsson continued to lead the team in steals, having 5 of the team’s 10 steals. Expect him to play an important role on the defensive end again this year, opponents shot under 40% while being guarded by Jon last season. KiShawn Pritchett ‘20 – Expect Pritchett to feed other members of the team as he dishes up the basketball. In the exhibition, he led the team with 6 assists while not committing a single turnover. Expect Pritchett to drive to the basket and score off the pick and roll with both resulting in above 1.0 PPP. scored 16 of his 28 points in just 11 minutes in the second half of the exhibition game. Expect Grady to be an additional 3-point weapon for Coach McKillop; he shot 5 of 10 in his opening game. Cats are likely to go wild as players come off the bench and contribute. Rusty Reigel ’18 and Jordan Watkins ’18 will continue their strong spot-up shooting and catch-and-shoot offense. On the defensive end, expect Dusan Kovacenic ’20 to contribute while opponents’ shots get swatted away by Nathan Ekwu ’18. 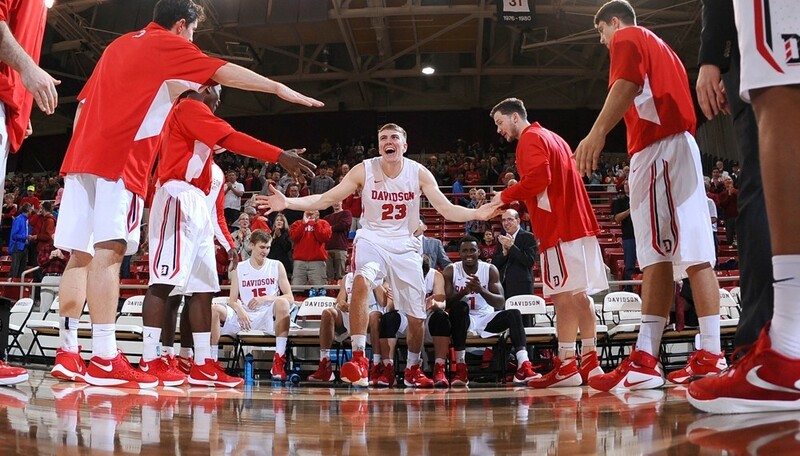 So, get ready for another season of Davidson men’s basketball. Get ready to cheer on the team as they fill up their box scores. And here at Cats Stats, we’ll keep studying the numbers to help get the team ready and help you get even further in the game off the court.